There are so many fun holidays to make the everyday more fun and memorable. In October, mark your calendar to celebrate National Taco Day!! But lets face it, tacos are more than welcome to be celebrated everyday of the week! 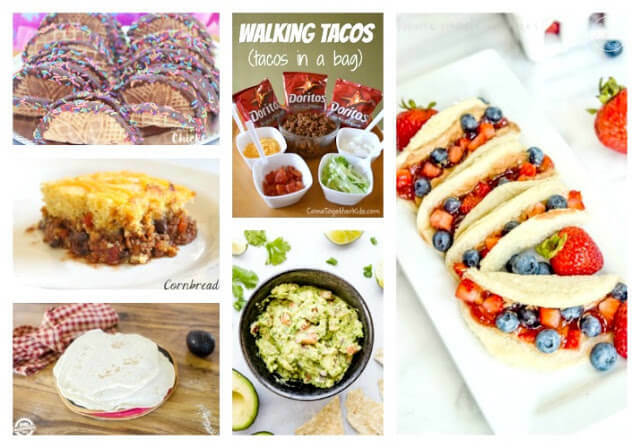 Plan some Taco Day fun with your kiddos with these taco themed games, activities, and recipes! In addition to Taco Tuesdays (or Wednesdays or Saturdays… hey! no one is judging! 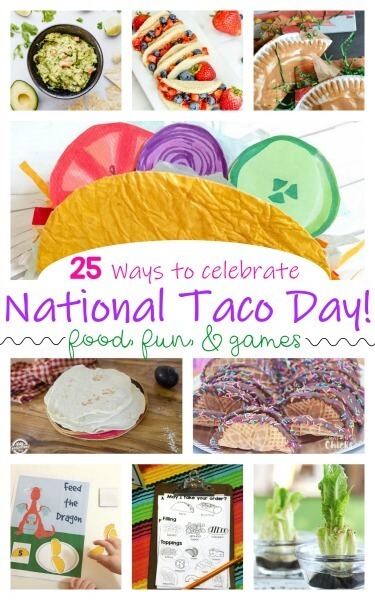 ), here’s a fun list of ideas to help you celebrate all things tacos! Keep it simple by trying a new taco recipe, or spice the day up with making a taco themed craft or playing a game. Who knew you could have so much fun celebrating National Taco Day?!! Felt Taco Burrito Pattern from In Our Pond. This would be fun to add to a play kitchen set! Acocado Friends Craft from Glued to My Crafts. What’s a taco without avocado?! Well, I’m not sure, it just wouldn’t be the same. Make this sweet craft for a friend. Paper Taco Craft from Glued to My Crafts. Tacos aren’t just for eating! Make this cute paper plate taco with paint and other supplies. Felt Taco Christmas Ornament from Orange Bettie. Because who doesn’t want their own taco ornament?! Too. cute. Let’s Taco Bout’ How Awesome You Are Card from DIY Inspired. How cute are these taco kindness cards?! Taco Collage from ArtsyCraftsyMom. I love the tissue paper cheese used for this craft! Fiesta Dinner Table Setting from The Crafting Chicks. This dinner table setting is definitely inspirational and will be the talk of dinner nights to come! Don’t forget to invite me! Taco Time Game from Get Your Holiday On. This game looks hilarious! Spin a Taco Game from J Daniel’s Mom. Here’s a fun learning activity to keep the kids busy. Dragons Love Tacos Math Game from Rainy Day Mum. 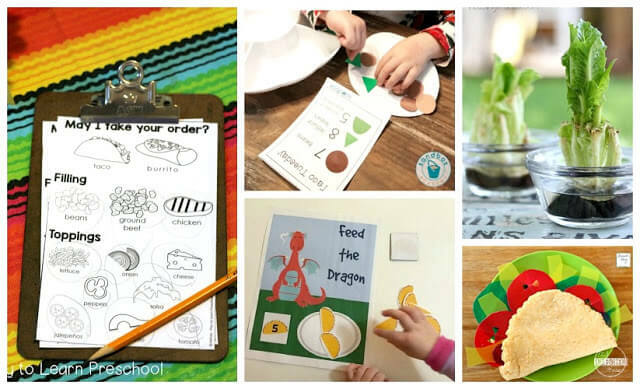 Practice counting with this math game inspired by Dragons Love Tacos. Taco Counting Activity from Sandbox Academy. Can your little learner add the right amount of ingredients to their taco? How to ReGrow Lettuce from Housing a Forest. Use the lettuce for your tacos and turn it into a science experiment! Great way to sneak in learning! Playdough Tacos from J Daniels Mom. Keep little ones entertained during National Taco Day by playing with playdough! Taco Stand Dramatic Play from Play to Learn Preschool. Set up a fiesta like this adorable dramatic play area! It wouldn’t be Taco Day without tacos, right?! I’ve got you covered with recipes to enjoy Tacos all.day.long! Crazy Taco Faces from Kenarry. These Taco Faces will sure bring laughter to the dinner table! Choco Tacos Shells from The Crafing Chicks. Dessert tacos… need I say more?! 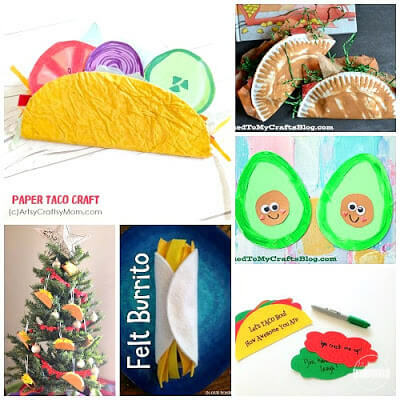 No Fail Tortillas from Kids Activities Blog. This recipe only requires 3 ingredients, so it’s an easy way to get the kids involved! Peanut Butter and Jelly Tacosfrom Homemade Interest. Save the meat and all the fixins’ for dinner, but you can still celebrate National Taco Day for lunch with these! Cornbread Taco Pie from Cutesy Crafts. This dish takes tacos to a new level. Yum! Walking Taco from Come Together Kids. Aka “Tacos in a Bag;” we first had this at church gather and my kids thought it was the coolest thing! Oreo Taco from Camille I am. This sweet treat is just too cute and creative! Fresh Tomato Salsa from Meaningful Mama. So easy to make the kids can help! Best Guacamole Recipe from Salt and Baker. What’s a taco without guacamole?! This recipe looks amazing! Slow Cooker (or Instant Pot) Salsa Verde Chicken Tacos from Freezer Meals 101. Save time cooking dinner with the slow cooker! Black Bean Corn Dip from See Vanessa Craft. This looks divine! Pass the tortillas, please! Taco Pasta from Juggling with Kids. This is a fun twist to pasta! Tacos AND pasta… together!! My kids would love this dish. 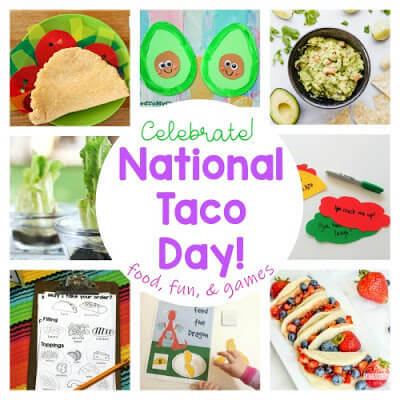 From crafts to activities to recipes, there are plenty of ways to celebrate National Taco Day! Enjoy!